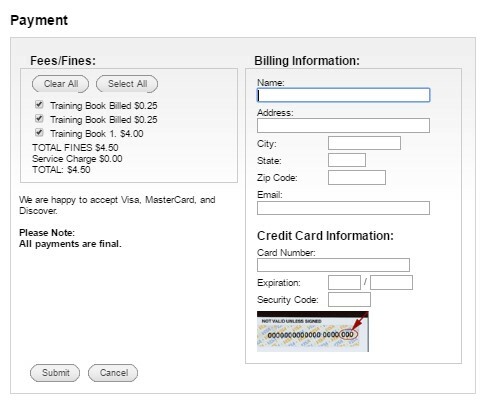 Pay your fines at fees by logging into your library account at home or in the library. A box will pop-up displaying the amount of your fine. Note: partial payment is not possible at this time. 4) You will receive a confirmation that your payment was successful. If you cannot find your library card, please contact us immediately. A staff member will deactivate the lost card right away to prevent unauthorized use. To receive a replacement card you will need to visit us at one of our eight library locations with photo identification and we can issue you a new card right away. There is a $2 fee to replace lost cards. 20¢ per black and white page. 30¢ per 2-sided print. 20¢ per black and white page per side. Adult, juvenile, District and Inter-Library Loan items: 25¢ a day. If more than $10 is owed, borrowing privileges are suspended. A bill for lost items is sent to you when your items are 45 days overdue. That bill will include a billing fee for each item. Also, if you owe more than $3 in fines, you will receive a notice for the amount. *If we can‘t reach you by phone after the 3 day calling period, you will receive a print notice by default. The library system may refer past due accounts with fines and fees of $45 or above to a collection agency. Books and media are expensive and unreturned materials are a loss to the entire community. Borrowers are responsible for the replacement cost of lost or damaged library materials. A billing fee of up to $11 will be added for each lost item. A cost of up to $8 will be charged for missing pieces from sets or kits..
DCLS covers basic fees for ILL materials. If a lending library assesses extra fees, those fees will be passed along to the patron. There will be a 50¢ per item charge for those items not picked up by last day available. Requests can be canceled either by logging into your library account or by calling the library where you wished to pick-up the item.